We’re well into September and your team is already on full speed after the summer. As you adapt back to a hectic work life, you’ll probably feel like reaching out for new tools. Today we want to make the case for any tools that could allow you to use the power of visual communication to your advantage. The transmission of ideas using symbols and imagery is probably the oldest form of communication. I’m finally back with a new blog post. This time I thought I’d share a 3 minute video to motivate you to keep reading: To kick us off on a week of blog posts all about the challenges of creative work, I wanted to suggest a book I’ve found while researching on the topic. If you work in technology, you’re probably always urged to think and work creatively. But with so many professionals trained to see creativity as an intriguing innate quality, it can often seem like there are constant blocks to your team’s creativity. Ship it now. Don’t wait up for perfection. Every time I blog here I know I may be read by people from a wide range of backgrounds. This means I need to make the core of my posts clear and direct, while the less fundamental parts remain open to whatever interpretation resonates with a reader’s context. My strategy is informed by personal experience. I’ve spent the last 10 years in 9 different countries. This lifestyle wouldn’t be possible without the notion of simplicity. We’re well into a typical Finnish summer. The evenings are bright and the weather changes faster than we can blink. Our community keeps growing - we’re over 87k visual thinkers. This post is a quick recap of our newest features. It’s our way to welcome newcomers and touch base with long-term users. Some features came by popular demand. After all, we value feedback and any chance to engage with other visual thinkers. Riding The Remote Wave - Is It Sane? Our new comic strip Remotely Sane follows a typical startup team in their quest for flexibility and autonomy at work. After months in a coworking space, the team decides to go remote and concentrate on what really matters - offering an amazing product. The arrangement suits the CEO, who tends to travel a lot. The developers like the possibility of working from anywhere, and the support agent finds it easier to focus in a quieter office. I’m sitting in a small coworking space. My teams members are just a few steps or clicks away, and I know I could always reach out to them, whether it’s to ask about a task or how their weekend went. Although we communicate differently, we generally live by the same mantra - “take 5 minutes now, save 5 hours later”. This is very far from a previous job, where all my weeks would begin and end with all-hands meetings, and no morning could be started without a daily scrum meeting. Sketchboard is on a roll! After going over the 80k user mark, last week we went to Arctic15 - a two day event where entrepreneurs, investors, corporate acquirers and media took over Helsinki’s Cable Factory. We were lucky to get visits from like minded professionals, from Sendgrid, Leadfeeder, Holvi Dreambroker, EntoCube, Microsoft Flux and Hub13 among others. There were also plenty of chances to meet bright examples of student entrepreneurship, academics and potential mentors. We’ve kicked off the conversation and we can’t wait to start hearing from your team. This week we wanted to keep breaking the ice by giving you a practical challenge: Start sketching today! You might think you’re not talented enough, say you can’t sketch to save your life and close this window. Maybe you find sketching would waste your team’s time. But be honest - are the daily Scrum standups saving you time? This week we reached 80.000 users! If you’re one of them, let us take this opportunity to thank you for using Sketchboard! We’re on a bootstrapped mission to help developers to collaborate visually together. Anything can start from just a simple sketch. Next we’d like to reach 100.000 users, so we’d be delighted to get your feedback and hear how you think we could improve. We’d also appreciate any time you could take to tell your team and your friends about us. If you start working as a software developer today you don’t automatically turn into an odd, unintelligible creature. In fact, you’ll probably find your ideas get valued by professionals in other areas - anyone who creates for a living is bound to come across methods or tools first thought out by software developers. In the past you’d risk being caricatured as someone with excellent technical skills, but nearly no verbal ability. 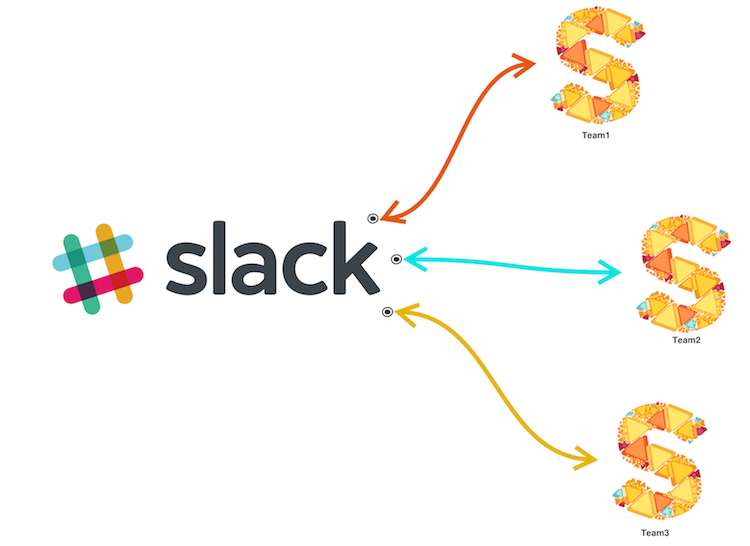 Previously Sketchboard for Slack integration supported only possibility to integrate multiple Slack teams to one Sketchboard team. What has been missing is to integrate one Slack team to multiple Sketchboard teams. Now support has been added and completes integration scenarios between Slack and Sketchboard. This has been especially tricky situation when you have a big Slack team and where everyone doesn’t work on same projects. You could have smaller users’ project and multiple users’ projects that are completely isolated.